From time to time I bring a pipe to work and smoke while driving through the city. While responding to a call I heard my pipe, in its case, hit the floor. After the call I rummaged through the vehicle searching for the pipe. I could not find it and had another place to be so off I went. I searched the car two more times that night. Then it hit me...the pipe was GONE! Back to the location of the original call. There in the dimly lit street it lay. A crushed case next to a manhole cover. Dare I look inside? I had to. The pipe had to have fallen out and landed beneath the car while I was searching for it earlier. The sound of it hitting the floor was actually the sound of it hitting the door where it must have been resting when I opened it. The stem was shattered and the Meerschaum bowl was scuffed badly on one side. I managed to hold in the tears. "Do I replace it?" I thought. No. Revive the beauty I have been working on as it has just begun to color. A new stem would put it right back in service. The scuff adds character. A scar to attract attention and a reminder of how careless I was and how blessed that it could still be salvaged. 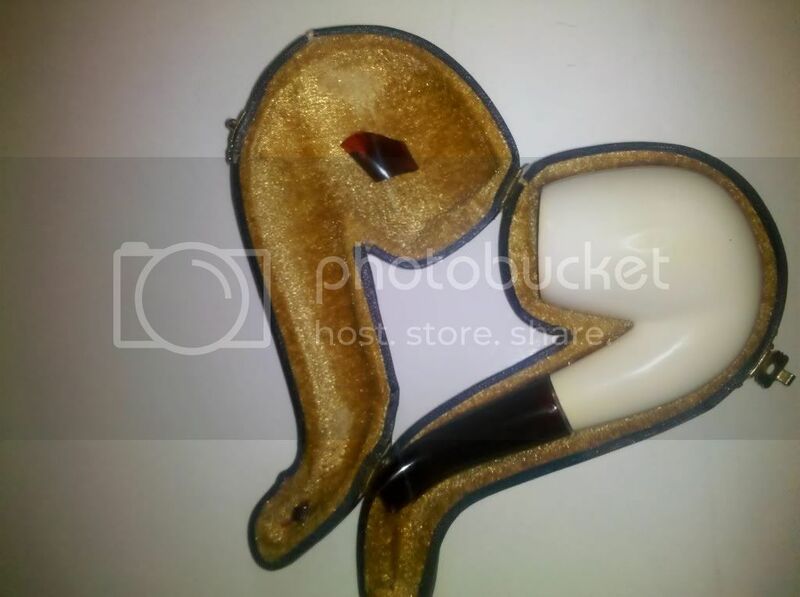 In short, my bent Meerschaum needs a stem. Any advice on what to get and where? "NEVER STARE DIRECTLY INTO THE MUSTACHE." I dont know if walker briar works does replacement for meers, but it couldnt hurt to email them. Sad to hear the demise of the stem. Lets see the aftermath. And you will have to probably send it off to get fitted for a stem. there are several companies that can do it...some of the guys on here may be able to do it even. If you can't pack it, light it, and smoke it then why do it. It's a dieing art that must be rekindled in all of us as fortold by our forefathers. Words to live by for all pipe smokers. I checked Walker now I will check ebay. The coloring is not evident in the picture. Well it looks like you got lucky this time. It's a good thing the case didn't open, that could have been tragic. Nice meer by the way...hope it gets healed soon so it can color nicely. Other than that in the past I have bought pipes for cheap on ebay and canibalized them for stems or parts, but in order to get exactly what you want I would probably spend a little more and talk to the vtpipes guys. I'm glad it wasn't a personal injury! In a society that has destroyed all adventure, the only adventure left is to destroy that society.